Meuché in a 2003 photo. Steven Meuché, retired GM of WKAR in East Lansing, Mich., died Jan. 23 at age 74. Meuché devoted his career to WKAR, a dual-service public broadcaster licensed to Michigan State University. He started as a college student and joined the staff as a producer/director in 1965. As Meuché stepped up into radio programming and management jobs, he moved into national roles, serving on the NPR board and backing efforts to apply audience research to radio programming. 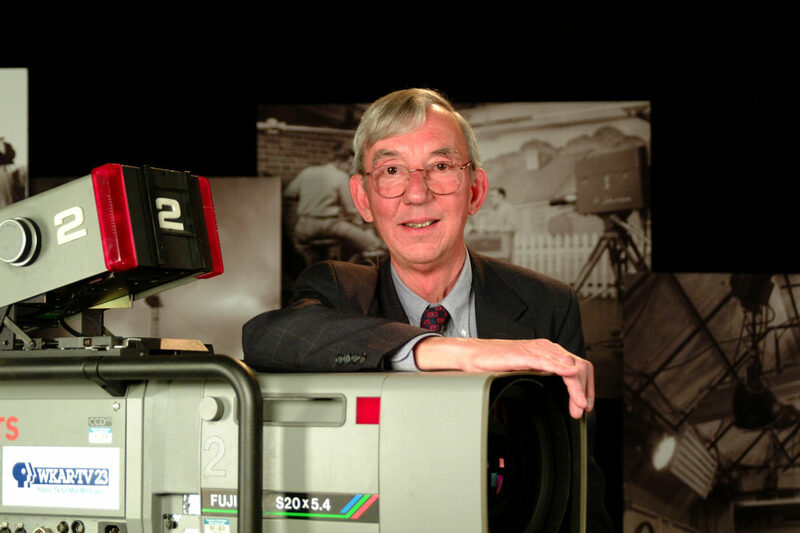 He became director of WKAR’s radio and TV stations in 1989 and retired in 2004. Susi Elkins, the station’s current director of broadcasting and GM, described Meuché as a “champion of WKAR’s education efforts,” including through his role in launching Ready to Learn on WKAR-TV in 1996. The federally funded initiative expanded public TV’s involvement in preschool education through programming and local outreach programs. Meuche remained “committed to that work” even after the U.S. Department of Education program reduced its funding to local station projects. 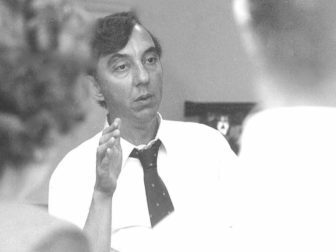 Meuché at an NPR board meeting in July 1983. Meuché was chair of the NPR board’s finance committee in 1983 when he told fellow directors of a $2.8 million deficit that had escaped the notice of auditors, according to Michael McCauley’s NPR: The Trials and Triumphs of National Public Radio. The shortfall, which turned out to be much deeper than the first estimate, set off the worst financial crisis in NPR’s history, triggering a shake-up of NPR management and layoffs of 84 employees. Meuché continued to serve on the board as a new management team took control, though he stepped down as finance committee chair, according to McCauley’s account. Meuché became involved in other radio organizations that advised stations on audience growth and best practices. He was an early participant in the Station Resource Group, according to co-CEO Tom Thomas. He was one of the signatories on the SRG charter and served on its board from 1987–88, Thomas said. He also served on the Radio Research Consortium board. Meuché also served as president of the Michigan Association of Public Broadcasters. He is survived by his wife Susan Meuché, his two sons Matthew (Grace) and Patrick (Natalie) Meuché, his brother Robert (Kim) Meuché, his grandchildren Alexis (fiancé Nicholas Goodman), Peyton, Melanie and Abigail Meuché. No formal service has been planned because Meuché “was a man who preferred to celebrate life,” according to an obituary. The family requests memorial donations to the Greater Lansing Food Bank’s Garden Project. Sorry to read about Steve Meuche’s passing. He was program director of WKAR AM-FM in the early ’70s when I worked there as a Michigan State student. Very early one Sunday morning, I realized halfway through my newscast that I had left the other half of my wire-service copy in the newsroom one floor down from the studio. I thought there’d be enough time during a 45-second “cart” to run down, grab it, and run back up. I forgot about the losing-my-breath recovery time and gasped hard for a while before finishing the ‘cast. Hoping no one had been listening that early on a Sunday, I saw the studio phone light up right as we went back to network. Yes, it was Steve asking what the Hell was going on. Though mortified to this day, I learned not only about breath control but also about the dedication of a great radio leader to always be on duty, checking in on the product.